Akumal is a small seaside village located on the Caribbean coast of Mexico, about 60 miles south of Cancun in an area call the Riviera Maya. If you are looking for the charm of the Caribbean at a slower pace of life, along with brilliant white beaches and excellent snorkeling and SCUBA diving, this is a great choice. Akumal is 16 miles to the north of Tulum, one of the most visited of Mexico's archeological sites, making it an excellent jumping off point to explore the treasures of the Riviera Maya and the interior. The name Akumal means "Place of the Turtle", due to the fact that sea turtles nest here each year from the end of April to October. These magnificent creatures can frequently be seen swimming in the shallow waters near Akumal. An important local organization, the Centro Ecologico Akumal, is dedicated to protecting these animals. 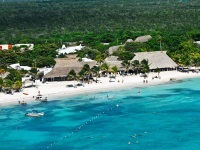 Akumal's shallow bays are a popular destination for scuba divers and for those who enjoy snorkeling. The water is an incredibly brilliant turquoise blue color with fantastic clarity. The world's 2nd largest barrier reef occupies these waters and the abundance of sea life is amazing. There are over 500 species of fish and 4 different species of sea turtles that can be seen here. For those who prefer fresh water, there are a number of cenotes (sinkholes) that provide entrance to underlying cave systems, offering the cave diver fantastic opportunities for exploring. Adventures on land include exploring the surrounding jungle where hidden caves can be explored and where exotic flora and fauna can be seen. Deep-sea fishing is an active sport in these waters as well; the promise of a day's catch might include Mahi Mahi, Kingfish, Marlin or Sail Fish. The town of Akumal has a rich and fascinating history. 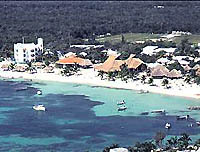 Akumal was originally a seaport and trading center of the Maya. However, in the 16th-century a historic event occurred that had a lasting impact on the area. In the year 1513, a Spanish galleon shipwrecked off its coast. Seventeen sailors made it to shore and were promptly made slaves by the Maya. Only two of these sailors survived their ordeal, one of these men, Gonzalo Guerrero, married a Mayan princess. Their union created the first mestizos. Gonzalo so integrated himself with the Mayan people, he no longer considered himself a Spaniard. Today, a statue of Gonzalo Guerrero greets the visitor at the entrance to the town of Akumal. 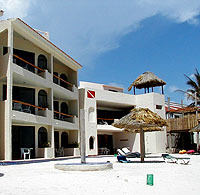 The following buisnesses provide services in the caribbean village of Akumal, Quintana Roo. Welcome to Akumal's very first resort and beach club. 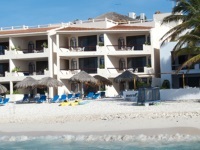 Packed with history, Hotel Akumal Caribe rests on a calm bay in the Riviera Maya, just a short drive South of Cancun. Expect beautiful white sand beaches and bright blue water perfect for snorkeling to experience the majestic sea turtles. If your idea of a vacation includes the sugary white sand of a beautiful beach next to the warm Caribbean ocean painted in every color of blue, then Akumal Villas is your dream come true. With Luxury villa accommodations spanning the most beautiful parts of the Riviera Maya, Akumal Villas can assist you in planning every detail of a perfect holiday. Located on the private bay of Aventuras Akumal, the furthest bay south of the Akumal bays, Villas De Rosa Resort, is a boutique resort of 27 bedrooms in total, comprised of one, two, three bedroom condos all facing the Caribbean Sea with ocean front views. The hotel rooms overlook the swimming pool to the jungle side. All condos have private balconies, living rooms, dining rooms, and fully equipped kitchens, with ceiling fans throughout and bedroom air conditioning. Each bedroom has a private bath.